Thanks to the wonderful international readers who responded to my post a few weeks ago I am excited to start my series on Latter-day Saint Women Around the World today! My first guest post is by Gabriella who is a Relief Society President in Pecs, Hungary. I have so enjoyed getting to know Gabriella and loved hearing her testimony. She is an inspiration. The questions I asked are in bold print and her responses are posted below. Most of the people in Hungary belong to the (Roman) Catholic Church but some Internet polls say that almost one third of the population do not follow any religion or believe in God at all (40 years of communist rule gives an explanation to that). My experience is that even "religious" people don't attend church regularly, mostly the elderly do especially in the rural parts of the country. Though business and stores work on Sundays there is a tendency to keep them closed at least on major bank holidays. When I was a child I did not believe in God. 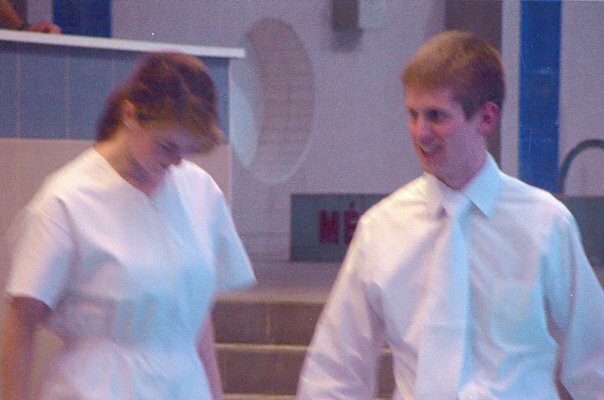 Both my parents were baptized to the Catholic church after being born. My maternal grandfather was said to be a Jew but he not only never practiced any religion but he put his "faith" in the Communist party and materialism. In our family we never talked about faith, religion was considered something to blindfold unsatisfied people. Through the years I developed my own faith, first it did not have much to do with God. The birth of my child made me realize I needed to make a commitment to God and that we both need to be baptized. Don't misunderstand me: I was looking for an easy way. I never had any intentions to take an active role in any church. And when I started seeking was the exact time that I met the missionaries 2 years ago. This Elder baptized me after a 4 month investigation and he was teaching me the Gospel for 8 1/2 months altogether till the end of his mission! Everything the Gospel said, everything the Elders taught matched my opinion of the world. My testimony came line by line very clearly and undoubtedly. I obeyed a commandment and I received the blessing accordingly. Never doubted the Gospel was true, only had doubts in myself if I can endure. I was endowed last month on my 40th birthday which makes it even more unforgettable. 3. What is the LDS church attendance like in your area? How many stakes, wards, or branches are there in your area? On an average Sunday how many members attend church? Do people have to travel far to attend church? What are the demographics of your ward? Are most members young, old, married, single, are there more women than men? Or it is it a good balance? 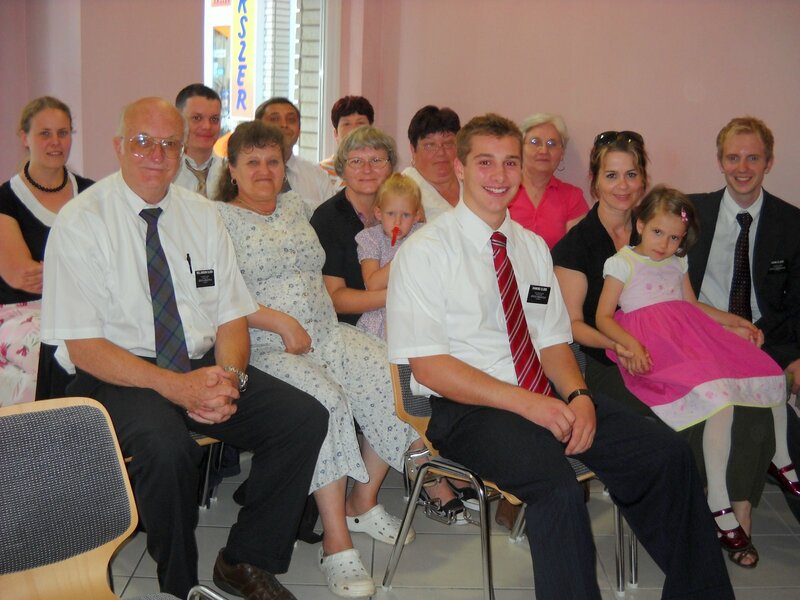 To my knowledge there are about 4600 latter-day saints in Hungary, 1 mission, 1 stake, 2 districts and 25 branches. The LDS church has been present in Hungary for about 20 years. I would say there are not too many old people in our branch, I say they are mostly my age or younger. (I hope being 40 does not make me old). There is a common characteristic to most of the members: they come from a background/family with problems - single parents/divorced/disabled/immigrants (Hungarian minority in another country)/gypsies (minority in Hungary)/unemployed. And there are a LOT more women than men!!! We don't have our own church building yet. The place where we reside at the moment used to be a bank office downtown. The nearest temple is in Freiberg, Germany, about 900 kilometers from Pécs. It is the first temple built in the Communist area (East Germany at that time) and the smallest. It was dedicated by President Hinckley in 1985. Poland, Chech Republic and Hungary also belong to this temple. We visit the temple in pre-scheduled group visits. Each month they have special weeks for Hungarians, Chech and Polish people. During these weeks ordinances are done in our own languages not in German. We can hardly wait to have our own temple here in Hungary! Most people identify Mormons with the Amish and all they have ever heard of is polygamy. Those who learn more about us get to like us and appreciate the values we share. On one hand listening to solicitors here equals being "brainwashed". People are ashamed of being religious, they like the image of keeping everything in their own hands. But on the other hand they see the faults of other churches-- the contradiction in their teachings and way of life. There are many "blank ones" due to the Communist era when there was no religious education and these people are open to spiritual thoughts. In our branch we have 6-8 baptisms a year (at the local public pool ). I think the greatest barriers are people themselves: they are not willing to give up their life style, habits, time, and MONEY!!! Big families are quite uncommon. Today's politics and economy does not make it easy for parents to raise children. In our ward we have a family with 4 and two other families with 3 children. But if you see a family with more than 2 children you can be suspicious that they were divorced before and are bringing their children from the previous marriage to the new family. I myself come from a very similar background. I have 2 brothers and 2 sisters. Both my parents divorced 2 times. I have never been married and I am a single mom with a daughter who is 6. Sisters usually visit 2 other active sisters, some have an inactive sister to visit teach too. We try to keep in touch with them as long as they let us. The sisters usually live in the same neighborhood, they don't travel far, there are no big distances. Visiting teaching gives me heartache as Relief Society president. The sisters do not yet feel the cohering power of visiting teaching. Maybe the 2nd or 3rd generations, who grow up going visiting teaching with their mothers or grandmothers will recognize what an important role they play in each others lives. We give teachings on visiting teaching every 3 months trying to keep them focused. We have a sister who underwent a brain surgery in June. She is now active again coming to at least sacrament meetings every Sunday!!!! She is stronger in her faith because of our prayers and the healing power of priesthood blessings. The greatest blessing to me is learning my potentials, being able to do things I would never have thought of because of fear or lack of experience. I am learning how to overcome my greatest opponent, myself. I have experienced that as long as I am faithful to my covenants I can count on the Lord's help no matter how hard the situation seems to be. You can see more pictures of the Pecs branch and the LDS church in Hungry in this video that Gabriella made for some of the senior missionaries before they went home. It is so fun to see the love and joy that their branch has for each other and for the gospel. Thank you so much Gabriella! I look forward to reading these! But "latter" has two ts. :) Blame it on the lack of sleep. Thank you Gabriella for serving so faithfully and standing your ground as a woman of God. I loved hearing about the church in Hungary. It reminds me of my missionary days of serving in little branches. I really like this idea, posting about women from all over the world. Thank you, Gabriella, for sharing about your life in Hungary. I really loved this post. Thank you for giving us a glimpse into the lives of LDS women around the world. I love it! Thank you, thank you, Gabriella. (and Heather too!) I appreciate you sharing your strength and testimony with us. Paige, thanks for the correction! How embarrassing. Spelling has never been my strongest point, but you are right this one could def. be blamed on lack of sleep! Thank you for sharing, Gabriella! And thank you, Heather, for inviting wonderful women like Gabriella to share their experiences on your blog. It was nice to "meet" you, Gabriella! I love this. What a good example and reminder to us. Can't wait to read more. Ack! I know all of these posts are going to make me cry. Gabriella, thank you for sharing about the church in Hungary. I grew up in a branch in the southern USA and we experienced many of the same hardships. It just goes to show we all have similar struggles regardless of culture! Gabriella, Thank you so much for sharing with us about the Church in Hungary. I was blessed to be involved in the teaching of a Hungarian family here in the U.S. many years ago, and they taught me a real love of Hungary. This was a beautiful reminder of that experience! Gabriella, thanks for sharing! We spent last year in a small branch in Italy with some similar struggles. It is hard to be one of the few who seem to be carrying the whole branch on their backs! Thank you for sharing your story and your faith.